London, United Kingdom: The International Youth Federation announced today the appointment of Ms. Julia Blocher of the United States of America as IYF President, to succeed Krystel SANEH of Lebanon as she will step down today, 15 November. Adopting a consensus resolution put forward by its Board of Trustees, the IYF elected Ms. Blocher as IYF President for a four-year period, ending 14 November 2022. At the end of her term, Ms. Saneh said: “President-elect Blocher is well known to all of us in the hall. But she is perhaps best known where it counts most: on the frontlines of global sustainable development and youth empowerment,” referring to her time as a Project Manager at the UN University. 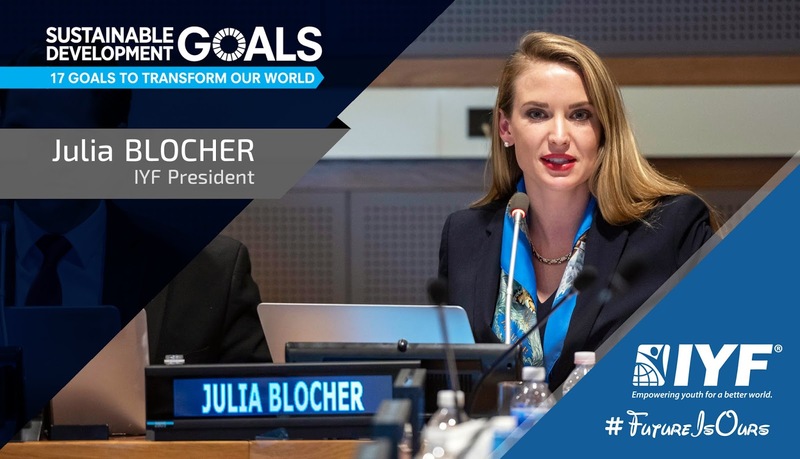 And she added: "I am confident that Ms. Blocher will serve the global youth community with dedication and be the voice of the world youth through her term". “Ms. Blocher is a leader with exceptional international experience and vision who has worked on some of the most challenging issues of our time, she has a proven ability to build and lead teams and improve the way organizations perform. Importantly for the IYF, she also understands that transparency and accountability are at the heart of any responsible organization.” Said His Excellency Ambassador Saeed ZAKI, IYF Secretary-General. Ms. Blocher brings to this position a wide range of experience in the fields of innovation, think tanks, academia, and evidence-based policymaking. She is currently a researcher and Ph.D. candidate at the Potsdam Institute for Climate Impact Research (PIK), a climate and environmental policy think tank outside of Berlin, as well as an Associate Member of the Hugo Observatory of migration (Belgium). Prior to her current role, she served as a Project Manager at the United Nations University (UNU) Office in New York, and she previously worked for the “Politiques de la terre” (earth politics) project at Sciences Po Paris, at the Internal Displacement Monitoring Centre (IDMC), and for the United Nations Refugee Agency (UNHCR). Ms. Blocher holds a Master’s degree in International Affairs from Institut d’Études Politiques de Paris (Sciences Po Paris).